These Smoked Salmon Roulades make an easy yet elegant brunch, breakfast, or appetizer dish to serve your family and guests. Smoked Salmon Roulades will add a touch of class of any dinner party or wine tasting. 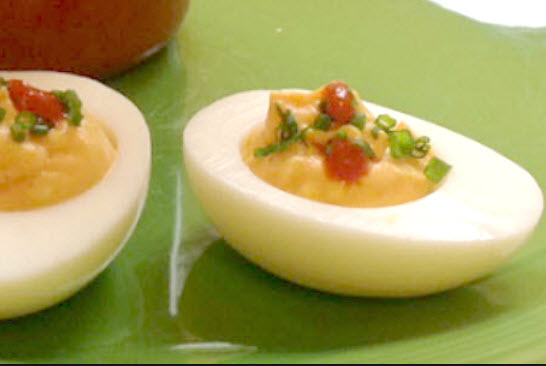 A wonderfully creative snack that will have all your friends begging for more! This is also a great make ahead appetizer as you can make these Smoked Salmon Roulades in advance, wrap in plastic wrap, and freeze for up to 1 month. When ready to use, defrost for about 1 hour at room temperature, before slicing and serving. I usually use salmon roe when making this dish to cut back on the cost. No one seems to know any difference. Learn all about American Caviar. Trimming the salmon for this dish is not an exact science. In a perfect world, you would have all the salmon roll rectangles exactly the same size, but in fact you may need to patch the rectangles to approximate the size specified. The finished rolls will still look good. If the salmon pieces are thick, you can pound them gently with a meat mallet or rolling pin to make them thinner and larger. As you trim, reserve a few good-size pieces of fish to use for patching, but set aside about 1/4 cup of the smaller pieces for the salmon mousse. In a food processor, combine 1/4 cup of the salmon trimmings and the butter. Process just until blended, scraping down the sides of the bowl; set aside. In a small saucepan, combine the clam juice and gelatin. Let stand for 5 minutes. Place the pan over low heat and stir just until the gelatin dissolves. Remove from the heat and stir in the Tabasco and Worcestershire sauces. Pour into the food processor with the salmon mixture and pulse 3 or 4 times, just to blend. Transfer to a large bowl. Whip the cream until stiff peaks form. Add 1/2 of the whipped cream to the salmon mixture and gently fold together. Gently fold in the remaining whipped cream just until no streaks remain. Cover and refrigerate for 10 minutes to allow the gelatin to begin setting. Place a piece of plastic wrap slightly larger than a salmon rectangle on a work surface, and form the salmon rectangle with the salmon slices on top, long side facing you. If necessary, patch with trimmings to make the correct-size rectangle. Do not worry if there are a few gaps; these may be concealed with the caviar garnish. Spoon approximately 3 tablespoons of the prepared salmon mousse lengthwise across the center of the salmon. Using the plastic wrap, pull the edge of the salmon nearest you up and over the mousse and down in the back to meet the other edge. Twist the ends of the plastic to seal and pat into an even log. Repeat with the remaining ingredients to make additional rolls. Place all the rolls in the freezer for about 2 hours to set. Remove from the freezer and let stand for 10 minutes. After 10 minutes, remove the plastic and trim off the untidy ends. Slice the salmon rolls into rounds 3/4 inch thick and place on a serving platter. Let stand for 5 to 10 minutes to finish thawing. Place a generous 1/4 teaspoon of the wasabi tobiko, salmon roe, or caviar on top of each round and serve. Makes about 20 to 25 smoked salmon roulades. * Number of rectangles will depend on how many smoked salmon slices you have. ** It is always best to measure the the amount of gelatin needed as the envelopes of gelatin can vary. Learn how to use Gelatin in your cooking and also the history of Gelatin, Gelatine, and JELL-O. Source: Recipe adapted from Williams-Sonoma Collection Series, Hors d’Oeuvre, by Brigit L. Binns (Simon & Schuster, 2001).